Aric Almirola picked up the 6th last-place finish of his NASCAR Sprint Cup Series career in Sunday’s Sylvania 300 at the New Hampshire Motor Speedway when his #43 Smithfield Ford was involved in a single-car accident that ended his run after 35 of 300 laps. The finish, which came in Almirola’s 171st series start, was his second of the season and his first since the June race at Pocono, 14 races ago. Since the last-place run at Pocono, Almirola set his sights on giving the Richard Petty Motorsports team its second-consecutive Chase appearance. In the twelve races between then and the Chase cutoff, Almirola racked up six top-15 finishes and remained mathematically eligible at Richmond. There, he rallied in the late stages and even threatened to upset Matt Kenseth’s dominant Toyota before a controversial restart left him 4th and out of the title hunt. Despite the setback, Almirola picked up where he left off at Chicago and finished 10th. He looked for a similar strong run at Loudon, where he’d come home 15th in July. Almirola’s “Petty blue” Ford was 27th-fastest in Friday’s opening session, but he jumped to 15th in qualifying with a hot lap of 136.697 mph. On Saturday, he remained consistent with a 19th-fastest run in the morning before settling for 25th in Happy Hour. The 43rd starting spot in Sunday’s field went to Timmy Hill in the unsponsored black #62 Premium Motorsports Ford, a car that was more than six-tenths slower than Travis Kvapil, the lone DNQ in The Motorsports Group’s #30 Curtis Key Plumbing Chevrolet. Before the start of Sunday’s race, Hill conceded the spot to Jeffrey Earnhardt. Earnhardt, making his second start in three races driving Go Green Racing’s #32 Arundel Ford / Weirs GMC Ford, had on Saturday made hard contact with the outside wall from an apparent stuck throttle. The team managed to repair Earnhardt’s ride, only to have to change the rear gear before race day. Hill re-took last from Earnhardt on the first lap, but Earnhardt retook it on Lap 6 and was the first to be lapped around Lap 14. By Lap 17, Hill had regained the 43rd spot when he was suddenly three laps down along with the #40 Interstate Moving Services Chevrolet of Landon Cassill. Cassill’s car was smoking during the early stages as it leaked power steering fluid, forcing at least two trips behind the wall in the first 30 circuits. The stops dropped Cassill behind Hill, and as he continued to lose laps, it appeared Cassill would score his first last-place finish since Bristol in April, thus breaking his tie with Alex Bowman for the 2015 LASTCAR Cup Series lead. Then, on Lap 36, trouble found Almirola. Running mid-pack at the time, Almirola suffered the first of a series of right-front tire failures that wreaked havoc with Sunday’s field. The #43’s incident happened in Turn 2, and the car rode the wall for several yards before it came to a stop. Fortunately, Almirola walked away unharmed, though his machine suffered sever damage to the entire right side. Almirola tumbled to 42nd by Lap 39, when Cassill’s last-place machine returned to the track just 17 circuits behind Almirola. On Lap 47, Cassill was just ten laps away from dropping Almirola to last when his power steering failed completely in Turns 3 and 4, spraying fluid all over the track and causing a five-lap caution of his own. When the #40 rolled behind the wall, it again appeared that Cassill would hang on to the 43rd spot, but the determined Hillman-Smith Motorsports team managed to make repairs and get him back on the track on Lap 79. Almirola, however, never returned to the track, and Cassill passed him for the final time on Lap 91. Cassill managed to bring his car home 38th after a series of mid-race crashes. First to plummet on Lap 121 was Alex Bowman, whose lapped #7 Nikko / Road Rippers Chevrolet crashed hard in Turn 3 from what was either a hung throttle or tire failure. On Lap 160, Cassill was about to drop Bowman to 42nd when Chase contender Kyle Busch’s #18 Pedigree Meatier Recipe Toyota also hit the Turn 3 wall. Busch fell into the Bottom Five on Lap 175, but despite hitting the wall hard enough to lift the left sides off the ground, he later joined Cassill in his climb up the field, eventually passing Cassill to snag a 37th-place finish. Between Bowman and Cassill were David Ragan and Danica Patrick, who came home 40th and 41st. On Lap 205, Patrick’s #10 GoDaddy Chevrolet crossed the nose of Ryan Newman’s #31 Caterpillar Chevolet entering Turn 1 and backed into the outside wall, then rolled into the path of the passing Ragan, shearing off the right side sheetmetal of Ragan’s #55 Aaron’s Dream Machine Toyota. Kyle Busch passed the pair on Lap 240. 39th went to still another tire issue, this one suffered by Justin Allgaier’s #51 AccuDoc Solutions Chevrolet on Lap 239 - the ninth and final caution of the day. Two drivers made their Sprint Cup debuts on Sunday and managed to avoid all the carnage. Rising modified star Ryan Preece came home 32nd in Premium Motorsports’ #98 Mohawk Northeast / East West Marine Chevrolet. The car was prepared by Tommy Baldwin Racing after an arrangement with Premium made in August, and the machine was painted to resemble the #2x modified ride of Preece’s grandfather Bob Judkins. Two spots behind Preece was 34th-place B.J. McLeod in Circle Sports’ unsponsored #33 Chevrolet. McLeod, a part-time competitor most frequently seen in Christopher Long’s #45 Tilted Kilt Chevrolet in the Truck Series, earned a career-best 25th at the track when he raced for Bobby Dotter’s XFINITY team this past July. 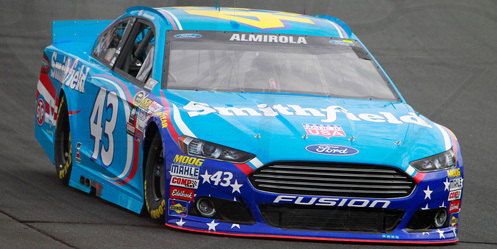 *This is the first last-place finish for both Almirola and the #43 in a Cup Series race at New Hampshire. *Almirola’s finish ends a three-race last-place streak by BK Racing, which came home 43rd in the previous Loudon races with three different drivers - J.J. Yeley, Clay Rogers, and Mike Bliss. On Sunday, BK Racing’s three cars came home 30th (Matt DiBenedetto), 31st (Josh Wise), and 33rd (Jeb Burton). Blake Koch picked up the 13th last-place finish of his NASCAR XFINITY Series career in Saturday’s VisitMyrtleBeach.com 300 at the Kentucky Speedway when his #8 Leaf Filter Gutter Protection Toyota was involved in a multi-car accident that ended his race after 2 of 201 laps. The finish, which came in Koch’s 141st series start, was Koch’s first of the season and his first since last fall at Chicagoland, 34 races ago. Koch finished one spot ahead of current last-place leader and 2015 LASTCAR XFINITY Series champion Jeff Green, who Koch also defeated for the LASTCAR title in 2014. Koch is currently in his first full season of XFINITY Series competition driving a fully-funded car since his 2011 campaign with MacDonald Motorsports. Coming into Kentucky, the results had been largely consistent with just four DNFs and a pair of season-best 18th-place finishes at Watkins Glen and Daytona, good enough for 17th in points. He also nearly scored his first NASCAR victory at Road America, leading five laps late in the going before his battery failed under caution. 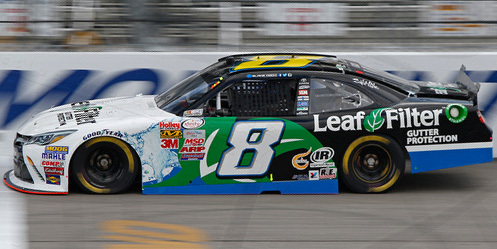 Even before the Road America race, Leaf Filter, which has sponsored most of Koch’s races, had already re-signed him for another full season in 2016. Saturday’s race at Kentucky was a golden opportunity for series regulars such as Koch as nearly all of the so-called “Buschwhackers” from the Sprint Cup Series would only be racing in New Hampshire. Koch was 27th in both Friday’s practice sessions and he improved to 24th in Saturday’s qualifying session with a lap of 173.338 mph. 40th in Saturday’s race went to John Jackson, Jr., the 51-year-old Scottish driver making his fifth start of the season and his first since last month at Mid-Ohio. Jackson’s unsponsored white #40 Motorsports Business Management Dodge secured the spot despite being nearly a second and a half slower than Mario Gosselin, who this time took a turn in his part-time #92 Chevrolet only to become the race’s lone DNQ. Jackson was still at the back of the field when trouble broke out at the start of Lap 3. Heading into Turns 1 and 2 that time by, contact between Brennan Poole’s #42 DC Solar Chevrolet and the #88 Alpha Energy Solutions Chevrolet of Ben Rhodes sent the #16 Lilly Diabetes / ADA Drive to Stop Diabetes Ford of Ryan Reed sliding directly into the path of Koch’s Toyota. Koch, unable to avoid a collision, wound up limping into the garage area with the nose of his car torn up. It wasn’t until the next time by that teammate Jeff Green pulled off the track in his #19 Premier Barter Exchange Toyota. The lap proved crucial when Koch was unable to return to the race - he edged Green by exactly that distance. Jackson pulled off the track soon after the restart and wound up 38th in the finishing order. T.J. Bell, back in JGL Racing’s #26 Toyota, spent 19 laps behind the wall and seemed certain to finish 37th, but Bell returned to the track when Michael Self’s #01 U Drive / U Text / U Pay Chevrolet crashed on Lap 28. Bell climbed out of the Bottom Five to come home 35th, dropping Self to 36th and Ryan Ellis to 37th. On Saturday, Ellis was again driving for Rick Ware, this time in the #15 Bubba Burger / BYB Extreme Fighting Series Chevrolet. While Ellis is tentatively listed as driver of Ware’s #17 next week at Dover, he’s also a candidate to instead drive for Obaika Racing in the #97 Vroom! Brands Chevrolet. Among the underfunded drivers and teams with strong runs in Saturday’s race were Ryan Sieg, who for the third time in 2015 equaled his season-best 12th-place finish in the #39 RSS Racing Chevrolet; 1990 Daytona 500 winner Derrike Cope, whose #70 Xcalibur Pit School / Buddy’s Home Furnishings Chevrolet came home 24th, his best finish since Dover in early 2014, and 21st-place Joey Gase - his best run in the #52 DB Sales Company / Donate Life Chevrolet since giving team owner Jimmy Means his first-ever top-five finish at Talladega in April. Ross Chastain, Jeremy Clements, and Ryan Truex were also in contention for top-ten finishes with 12 laps to go when all three were collected in accidents. *This is the first last-place finish for the #8 in an XFINITY Series race since October 27, 2001, when Mark Voigt scored his first career last-place run after the shock broke on Armando Fitz’s #8 Channellock Chevrolet after 6 laps of the Outback Steakhouse 200 at Phoenix. It was to be the Illinois drive’s third and final series start following a two-race stint driving his own equipment earlier that season. Justin Jennings picked up the 5th last-place finish of his NASCAR Camping World Truck Series career in Saturday’s UNOH 175 at the New Hampshire Motor Speedway when his #36 Mittler Bros. Machine & Tool Chevrolet fell out with electrical issues after he completed 7 of the race’s 175 laps. The finish, which came in Jennings’ 44th series start, was his second of the season and his first since Michigan, four races ago. 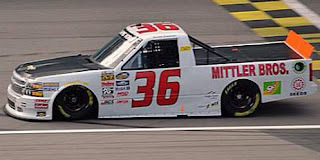 Combined with co-driver Tyler Tanner, MB Motorsports’ #36 Chevrolet has finished last in four of the previous five races, tying the team with Norm Benning Racing for the second-most in 2015. Jennings once again climbed in Mike Mittler’s #36 as this time the team’s primary #63 was to be driven by Akinori Ogata, the 41-year-old driver from Kanagawa, Japan looking to make his first Truck Series start since a 29th-place run at Phoenix last fall. Jennings was 28th-fastest of 32 drivers in Friday’s opening practice session, 26th in Happy Hour, and sped into the 27th and final spot based on speed with a lap of 123.182 mph. Ogata’s ENEOS Chevrolet was fastest of those ranked by Owner Points. He started 28th and finished 18th. Missing the show were current LASTCAR Truck Series co-leader Norm Benning in his #6, his first DNQ since Charlotte in 2013, and Josh Reaume in the #44 Obregon Construction RAM that previously ran last month at Mosport. Saturday’s race was marred by a chaotic start where several drivers again found early trouble. 32nd-place starter Timmy Hill in Premium Motorsports’ #94 Testoril Chevrolet spun on the very first lap. On Lap 3, Brandon Brown took 32nd from Hill as the crew made repairs on his #86 Coastal Carolina University / #TealNation Chevrolet. Brown was still classified as last when Jennings pulled off the track on Lap 8 followed by Caleb Roark in Jennifer Jo Cobb’s #0 Driven2Honor.org Chevrolet, MB Motorsports teammate Tyler Tanner this time in MAKE Motorsports’ #50 Landworks Solutions Chevrolet, and the #08 Trump For President Chevrolet of Korbin Forrister, the latter a truck damaged severely in practice. On Lap 37, Tyler Reddick brought out the second caution of the day when he spun his #19 BBR / Stoney Creek Records Ford in oil laid down by Jordan Anderson’s unsponsored #74 Mike Harmon Racing Chevrolet. After the ensuing caution and red flag for cleaning up the track, Brown returned to the track 41 laps down, and on Lap 47, he dropped Jennings to the 32nd and last position. Both Brown and Anderson - the latter 28 laps down when he came back from repairs for the oil leak - managed to climb out of the Bottom Five, dropping Roark, Tanner, and Forrister into the spots above Jennings. Roark now leads the 2015 LASTCAR Truck Series tiebreaker over the DNQ’d Benning based on Bottom Fives, 6-4. Rounding out the group was Spencer Gallagher, whose #23 Allegiant Travel Chevrolet finished one lap behind Brown after a trip to the garage for a busted rear gear. Austin Dillon, driving as Gallagher’s teammate for GMS Racing in the #33 Rheem Chevrolet, swept both practices and the pole en route to a win in what was the series’ 500th race. *This is the first last-place finish for both Jennings and the #36 in a Truck Series race at New Hampshire. 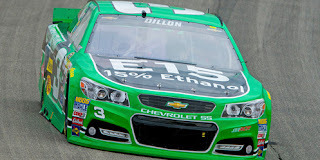 Austin Dillon picked up the 1st last-place finish of his NASCAR Sprint Cup Series career in Sunday’s MyAFibRisk.com 400 at the Chicagoland Speedway when his #3 American Ethanol E15 Chevrolet finished under power, 69 laps down, in the 267-lap race. The finish, which came in Dillon’s 76th series start, is also his first last-place run in 234 combined starts across NASCAR’s top three divisions. 2015 marks Dillon’s second season as a full-time driver in the Sprint Cup Series and the driver of the number grandfather Richard Childress and his driver Dale Earnhardt both made famous. The 2011 Truck Series and 2013 XFINITY Series Champion won the pole for last season’s Daytona 500 and Sprint Showdown en route to a 20th-place finish in points, but more impressively did not score a single DNF in 2014. While the streak ended with an electrical issue at Martinsville this past March, Dillon maintained his solid consistency. Even his terrifying last-lap crash into the catchfence at Daytona in July resulted in a 7th-place run - his third-best behind a 4th last month at Michigan. Dillon began the Chicago weekend on an equally-high note - a blistering 12th and final lap in Friday’s opening practice that put him 5th overall. The lap proved timely as the afternoon’s qualifying session was rained-out, meaning his time of 187.761 mph would start him 5th - fastest of the non-Chase drivers. On Saturday, the car still showed tremendous speed - he was 4th in the second practice and 9th in Happy Hour. Meanwhile, the final two starting spots in Sunday’s field belonged to Premium Motorsports, which thanks to the rain had both its cars in the race for the first time since last month at Pocono. 43rd belonged to Timmy Hill in Premium’s #62 ChampionMachinery.com Chevrolet, one spot behind Reed Sorenson in the unsponsored #98 Ford. The two out-pointed three part-time drivers who missed the show, including Ryan Blaney, who for the third time in eleven races saw his fast #21 Manufacturing Makes America Strong / SKF Ford rained-out of the field. Blaney was 9th in Friday’s opening session. At the end of Lap 1, both Hill and Sorenson were passed by Brett Moffitt and the #34 CSX “Play It Safe” Ford, who was sent to the rear due to a transmission change. Then by Lap 2, all three found themselves ahead of Denny Hamlin. The Chase contender started 29th after struggles in practice and spun with A.J. Allmendinger in Turn 3, dropping Hamlin a lap down. Hamlin remained last until around Lap 29, when Sam Hornish, Jr.’s #9 Walmart Ford made an unscheduled green-flag stop after contact with the outside wall. As Hamlin began his march toward a surprising victory, the ensuing 117-lap green-flag run saw all 43 cars on track, causing the last spot change hands between several drivers. Josh Wise finally got an opportunity to race the “Tide Ride” throwback for Go Green Racing, but his #32 BeerFrost.com / Skuttle Tight Ford took last from Hornish on Lap 47. Car 47 was next on Lap 52 as Allmendinger’s Food 4 Less / Scott Products / Clorox Chevrolet pitted during a round of green-flag stops. Sorenson’s #98 passed Allmendinger on Lap 61 followed by the #83 Cosmo Motors Toyota of rookie Matt DiBenedetto on Lap 105, Allmendinger again on Lap 107, Hill on Lap 110, Sorenson on Lap 114, and Hill again by Lap 120. Hill was still trailing the field on Lap 131 when Dillon found trouble. 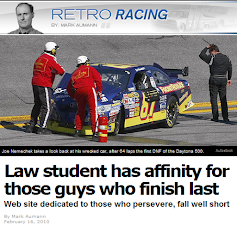 The youngster had been running inside the Top 10 for virtually the entire race when he slapped the outside wall in Turn 2 and slowed down the backstretch, the right side of his Chevrolet flattened and the right-front tire locked in place. Dillon’s was the first car to make the left turn into the garage area, and he would remain there for more than sixty laps. Dillon took last from Hill on Lap 135, just as the field went green. At that very moment, Kevin Harvick, the polesitter by virtue of his fastest lap in Friday’s practice, was trying to re-take the lead from Kyle Busch when his #4 Jimmy John’s Chevrolet made contact with Jimmie Johnson on the apron of Turn 1. Harvick’s left-rear tire trailed smoke as he started to lose positions, and just four laps later, he lost control in Turn 3 and backed into the outside wall. The damage to Harvick’s car sent him to the garage area as well. On Lap 143, Harvick fell to 42nd - eight laps ahead of Dillon. If Dillon returned to the track and completed more laps than Harvick, the defending series champion would begin the Chase with his first last-place run in 529 career Cup starts. However, both the Richard Childress Racing and Stewart-Haas Racing crews were able to rebuild their cars before the finish. Harvick returned on Lap 194, 57 laps down, while Dillon came out the next time by, 66 circuits back. Just two debris cautions slowed the action in the race’s closing stages, leaving Harvick and Dillon in the final two spots. Harvick kept pace while Dillon lost three more laps by the end. While Dillon finished last, Harvick ended up with the 5th 42nd-place showing of his career - curiously, Harvick started no worse than 7th in all five of those races. Hill, Sorenson, and DiBenedetto - the latter bringing out one of the debris cautions late in the event - rounded out the Bottom Five. *This is the first last-place finish for the #3 in a Cup Series race since September 28, 1992, when the late Dale Earnhardt’s #3 GM Goodwrench Chevrolet lost an engine after 111 laps of the Goody’s 500 at Martinsville. Three of Earnhardt’s five career last-place runs in Cup came during the 1992 season, all of them due to engine failures, leaving him 12th in points. He did not finish last in any of the 262 races that followed over the next nine seasons. *This is the first time since Fontana in March - 22 races ago - that all 43 drivers finished a Cup Series race under power. The last spot that afternoon went to Sam Hornish, Jr.
Jeff Green picked up the 77th last-place finish of his NASCAR XFINITY Series career in Saturday’s Furious 7 300 at the Chicagoland Speedway when his #19 Premier Barter Exchange Toyota fell out with a vibration after he completed 3 of the race’s 200 laps. The finish was Green’s 17th of the season, his second in a row, and came in his 413th series start. Green returned to the track in the newly-sponsored machine he debuted last week at Richmond as one of 41 drivers on Chicagoland’s preliminary entry list. Following Tuesday’s addition of Dexter Bean, back for the first time since Daytona in July as driver of King Autosport owner Mario Gosselin’s second car, the #92 Gamache Truck Center / Cote Chevrolet, Friday saw Rick Ware Racing withdraw driver Ryan Ellis’ #17 Ford that ended Green’s record eight-race last-place streak at Darlington. Green was 35th-fastest in Friday’s lone practice session, but improved to 29th in qualifying with a lap of 171.559 mph. Bean, meanwhile, also made it on speed in 28th, leaving Morgan Shepherd’s #89 Racing With Jesus Chevrolet out of its second-straight race. The 40th starting spot on Saturday belonged to owner-driver Derek White, whose white unsponsored #40 Motorsports Business Management Dodge ran the most laps of anyone in the first round of qualifying - seven - but couldn’t improve his slowest speed of 159.508 mph - four full seconds slower than the eventual pole speed set by Kyle Busch. Three laps into the race, Green had slipped to the rear of the field and retired from the race, beating Bean to the garage by three circuits. Finishing 38th on Saturday was T.J. Bell, who was making his third start of the season in JGL Racing’s #26 Toyota. JGL had another good showing at Chicagoland as teammate J.J. Yeley was 2nd-fastest in practice in his #28 Toyota and came home 19th. Another strong run was earned by John Wes Townley, who equaled his career-best 13th in the #25 Zaxby’s Chevrolet. White came home 37th while 36th changed hands between Benny Gordon’s #66 VSI / Somerset Regional Water Resources Toyota and the #22 Discount Tire Ford driven this week by Ryan Blaney. Blaney’s crash on Lap 104 dropped him past Gordon’s lapped machine on Lap 140, but Gordon retook it on Lap 148 when he pulled out with rear gear issues. *Green sweeps both last-place runs at Chicagoland for 2015 and has now finished last at the track four times since 2012. Tyler Tanner picked up the 2nd last-place finish of his NASCAR Camping World Truck Series career in Saturday’s American Ethanol E15 225 at the Chicagoland Speedway when his #36 Mittler Bros. Machine & Tool Chevrolet fell out with engine issues after he completed 5 of the race’s 150 laps. The finish was Tanner’s second of the 2015 season, his first since Bristol, two races ago, and came in his 10th series start. Tanner returned to MB Motorsports for the first time since the last-place run at Bristol to take his turn in the team’s “start-and-park” entry while Justin Jennings again drove Mike Mittler’s primary #63. The two Mittler trucks were among 36 drivers on the preliminary entry list, a group reduced before Friday’s practice to 34 after the withdrawals of Tim Viens and Mike Harmon. Tanner was 26th-fastest in that first session and would start 24th after qualifying was rained-out. Rain also pushed the green flag from Friday night to Saturday morning, and when it came, the 32nd spot belonged to Norm Benning, who took the spot by virtue of his 25th spot in Owner Points. Missing the race were Chad Boat in the #16 CorvetteParts.net Chevrolet, a new second team for Billy Boat Motorsports, and Ross Chastain’s #18 AISIN Toyota fielded by former series driver Shigeaki Hattori. Hattori’s team is still looking for its first Truck Series appearance since Brett Moffitt’s 17th-place run at Michigan in 2013. Several drivers were sent to the back with Benning, including two for engine changes that reports indicate had to do with damage after car covers came off several trucks during the storms the night before. One of the victims was Daniel Hemric, whose #14 California Clean Power Chevrolet was still smoking during the pace laps. On Lap 2, 27th-place starter Jennifer Jo Cobb’s #10 POWMIAFamiles.org / Driven2Honor.org Chevrolet slowed with a sudden engine issue of her own. 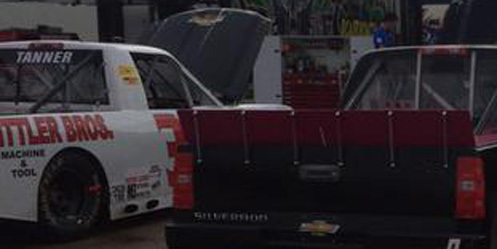 Sometime likely around Lap 25, Ross Chastain tweeted pictures of Cobb’s truck in the garage area along with teammate Caleb Roark’s #0, B.J. McLeod’s #45, and Tanner’s #36. By that point in the race, two more trucks had also joined the rapidly-filling garage: Hemric’s snake-bit #14 had dropped the driveshaft in Turn 1 on Lap 14, one lap before Jesse Little’s second series start ended with what was reported as a “catastrophic” engine failure on his #97 ProtectTheGarvest.com Toyota. Of this group, only Cobb and Hemric were able to return to the track laps down and finish under power, coming home 23rd and 25th, respectively. Tanner, meanwhile, stayed put and trailed the field, besting both Roark and Little by nine laps. Ryan Ellis saw his second-straight early exit from a Truck Series race while driving MAKE Motorsports’ #50, though this time he completed 18 laps in Mark Beaver’s Landworks Solutions Chevrolet. Rounding out the Bottom Five was McLeod - his fifth-straight bottom-five finish in the #45 Tilted Kilt Chevrolet. *This is the first last-place finish for both Tanner and the #36 in a Truck Series race at Chicagoland. Michael Annett picked up the 2nd last-place finish of his NASCAR Sprint Cup Series career in Saturday’s Federated Auto Parts 400 at the Richmond International Raceway when his #46 Switch Hitch Chevrolet was involved in a single-car crash that ultimately ended his night after 145 of the race’s 400 laps. The finish was Annett’s second of the season and his first since Bristol, two races ago. It came in the Iowa driver’s 62nd series start. 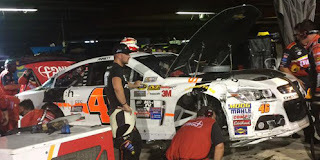 Following his first-lap exit at Bristol, Annett struggled to a 39th-place finish at Darlington after an early-race accident ripped the sheet metal from the driver’s side of his Chevrolet. Statistically, an equally-tall task was ahead of him at Richmond, where he’d finished no better than 33rd in three previous Cup starts. Rumors also swirled about the HScott Motorsport team’s driver lineup in 2015, and if Clint Bowyer would be joining the program next season. Clearly, on-track tensions for Saturday would not be limited to the drivers contending for spots in the Chase. In Friday’s opening practice, Annett was 35th-fastest of the 45 drivers entered, but he climbed to 32nd in Happy Hour before securing the 27th starting spot with an average speed of 127.095 mph. Missing he race were Josh Wise, his second DNQ in a row in his first attempt driving The Motorsports Group’s #30 Chevrolet, and Timmy Hill in the slower of two unsponsored Premium Motorsports Fords, his the #62. Starting 43rd on Saturday was J.J. Yeley, who was again looking to help BK Racing bring the #26 Maxim Toyota higher in Owner Points. 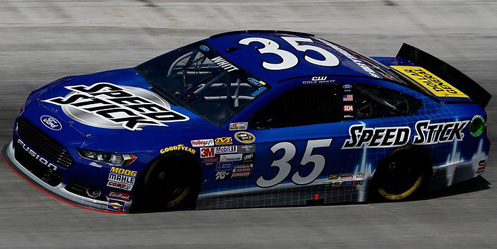 Yeley held the spot until Lap 2, when the #32 BeerFrost.com / CorvetteParts.net Ford from Go Green Racing slipped to 43rd. The #32 was driven this week by XFINITY Series regular Jeffrey Earnhardt, who was making his Cup Series debut. Unfortunately, Earnhardt was the first to be lapped on the 19th circuit, and he was still running in the rear when the first caution fell on Lap 39. That time by, Reed Sorenson in Premium Motorsports’ #98 Ford dropped oil entering Turn 1, causing several lead-lap drivers to slide up the track. Among them, 14th-place Martin Truex, Jr. tagged the outside wall and began to trail smoke, forcing a series of pit stops. As Sorenson pulled behind the wall to take last from Earnhardt, Truex made a stop just before the Lap 47 restart and lost four laps, leaving him 42nd. Sorenson came back out on Lap 95, moments before the second caution of the evening came out for debris. On Lap 113, Annett was running nearly two laps down in 32nd when he found trouble on the backstretch. Coming off of Turn 2, Annett slid into the #95 Thrivent Financial Ford of Michael McDowell, then was bumped into a spin by Jeb Burton’s #23 Estes Toyota. Annett’s Chevrolet switched ends, then made hard contact with the inside wall with the driver’s side of his machine. Annett managed to get the car re-fired, but then stopped at the entrance of pit road with the car leaking fluid. A tow truck pulled the #46 behind the wall under the 13-lap caution, and the crew set to work on repairs. On Lap 170, Annett took last from Sorenson. Although Annett would remain in 43rd for the rest of the race, the HScott team once again managed to get their battered machine back on track. This moment came on Lap 271, when he was 163 circuits behind leader Matt Kenseth’s dominant Toyota. Annett completed just a handful more laps before pulling out for the final time on Lap 308. McDowell came home 42nd on the night after a bizarre accident where his #95 clipped the safety truck entering Turn 3 during the fifth caution that came out on Lap 290. No injuries were reported, but most of the rear sheetmetal was torn off McDowell’s Ford, ultimately ending their night with a trip to the NASCAR hauler. He and Annett were the night’s only two retirees. Sorenson came home 41st, Earnhardt 40th, and Burton 39th, all of them 13 or more laps down. *This is the first last-place finish for the #46 in a Cup Series race at Richmond since September 10, 2011, when Scott Speed’s #46 T&T Performance Ford crashed 7 laps into the Wonderful Pistachios 400. Jeff Green picked up the 76th last-place finish of his NASCAR XFINITY Series career in Friday’s Virginia 529 College Savings 250 at the Richmond International Raceway when his #19 Premier Barter Exchange Toyota fell out with a vibration after he completed 2 of the race’s 250 laps. The finish was Green’s 16th of the season and his first since Road America, two races ago. With eight races to go, Green has already broken his 2013 record of 15 last-place finishes in a single season. Green was one of 41 entrants at Richmond, and was the slowest in Thursday’s opening practice with a single lap of only 77.548 mph - 12.590 seconds slower than Austin Dillon’s fastest lap of 121.474 mph. He improved dramatically with a lap of 119.011 mph in qualifying, good enough for 31st on the grid. Missing the show was Morgan Shepherd, whose #89 Chevrolet was edged by J.J. Yeley’s #28 Toyota by two-tenths of a second. When the green flag flew on Friday, the 40th spot belonged to Josh Reaume, back with Motorsports Business Management for the first time since a 39th at Mid-Ohio last month. Reaume’s #13 followed the field into Turn 1 when trouble broke out in front of him. 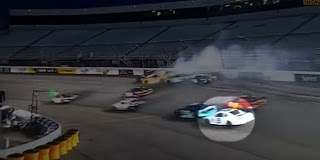 The 24th, 26th, and 28th-place starters of Benny Gordon, David Starr, and John Wes Townley made contact and spun, triggering a wreck that also collected Joey Gase, Carl Long, and Jimmy Weller III. Reaume avoided involvement, as did Green, who both cut to the apron to avoid contact. The two drivers whose vehicles were most severely damaged in the wreck were Weller’s #90 BYB Extreme Fighting Series Chevrolet and Gordon’s #66 Somerset Regional Water Resources / VSI Toyota. However, both were still edged for last by Green, who during the ensuing caution pulled the #19 behind the wall at the same time as Weller. 37th went to Starr, Green’s teammate in the #44 Zachry Toyota, his damaged #44 colliding with the Turn 3 wall on Lap 19. Long rounded out the Bottom Five for Motorsports Business Management in the white #40 Grafoid Dodge - teammate Reaume finished 28th, eight laps down to race winner Chase Elliott. *Green sweeps both XFINITY Series last-place finishes at Richmond for 2015 with his fifth last-place run at the track in the last eight series races. 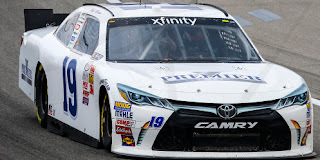 *This is the first last-place finish for the #19 in an XFINITY Series race at Richmond since September 10, 1993, when Tom Peck’s #19 Delco Remy Chevrolet lost the engine after 9 laps of the Autolite 250. It was Peck’s only last-place finish in 171 series starts from 1984 through 1995. Cole Whitt picked up the 2nd last-place finish of his NASCAR Sprint Cup Series career in Sunday’s Bojangles’ Southern 500 at the Darlington Raceway when his #35 Speed Stick Ford was involved in a crash that ended his run after 5 of 367 laps. The finish occurred in Whitt’s 75th series start. The finish was Whitt’s first of the year and his first since another early crash last year at Watkins Glen, 39 races ago. 2015 marks Whitt’s fifth season on the Sprint Cup tour and his first for Front Row Motorsports. Following a difficult 2014 where the collapse of Swan Racing sent he and his sponsors to a sudden third team for BK Racing, Whitt has continued to try and find a rhythm in NASCAR’s top division. He began the year with a 22nd-place finish in the Daytona 500 - the first of four top-25 finishes in the first six races - and earned a career-best 13th at Talladega. While inconsistency saddled Whitt with the 31st spot in points headed to Darlington, he’d failed to finish just one race all season - an engine failure at Atlanta that left him 37th. At Darlington, Whitt’s machine was one of just 13 of the 46 entered which did not have a “throwback” scheme of some kind. In fact, none of Front Row’s three cars participated in the promotion, choosing instead to run schemes used earlier in the season. Whitt was 41st-fastest in the opening practice session and 37th in Happy Hour, then secured the 37th spot on Owner Points after a lap of 175.159 mph. The only “throwback” car to miss the race was that of Josh Wise, whose Ricky Craven 2003 scheme on the #32 CorvetteParts.net / BeerFrost.com Ford was sent home with Travis Kvapil’s #30 Curtis Key Plumbing Chevrolet for The Motorsports Group and the #62 ChampionMachinery.com Chevrolet for Premium Motorsports. The 43rd starting spot went to T.J. Bell, who was making his first Cup Series start since September 30, 2012, when he came home 33rd driving for Frankie Stoddard at Dover. The #98 Royal Teak Ford that Bell drove for Premium Motorsports had changed hands twice during the week. It was originally to be driven by Reed Sorenson, whose wife Laura gave birth to their first daughter Ella on September 1. Bell was brought in to drive Premium’s #62 in Sorenson’s place while Timmy Hill drove the #98, but Hill and Bell switched rides again by Friday. In qualifying, Bell was 2 mph slower than Hill, but secured a starting spot based on his rank in Owner Points. Bell was joined by two cars sent to the back - Danica Patrick, who was running a backup black #10 GoDaddy Chevrolet, and Chase Elliott, whose #25 NAPA Auto Parts 1985 Throwback Chevrolet required a rear gear change before the race. Patrick took last from Bell at the start and held it on Lap 1, but Bell re-took it on Lap 2. The #98 was still trailing the field on Lap 6 when trouble broke out in front of him. Coming off Turn 2, rookie Brett Moffitt tagged the Turn 2 wall with his #34 Dockside Logistics Ford. Whitt, who was right on his bumper when it happened, couldn’t avoid contact and tore open his right-front fender. Elliott, climbing through the field, rear-ended Whitt, who spun to the inside of the track and collided with the inside wall. Moffitt and Elliott managed to keep rolling, but Whitt’s Ford was too damaged to continue. The crew pondered repairs, but around Lap 38, the team concluded nothing could be done and retired from the event. Moffitt, meanwhile, spent more than 30 laps in the garage before returning to the track. He came home under power in 36th while the Bottom Five shuffled behind him. By race’s end, 28 drivers were on the lead lap, but everyone from 33rd on back was at least 11 laps down. Many of those drivers were involved in multiple accidents that accounted for a record 18 cautions for 89 laps. When the dust settled, 42nd went to Patrick, whose #10 clobbered the wall off Turn 4 on Lap 190, then returned to the track 74 laps down only to cut another right-front tire and hit the wall on Lap 266. 41st went to Elliott, who after suffering nose damage in the Whitt accident made hard contact with the Turn 1 wall on Lap 229, taking him out of the race. 40th fell to David Ragan, his #55 Aaron’s Dream Machine Toyota honoring his privateer father Ken and the #77 TRW Ford he ran in the late 1980s. Ragan was on the lead lap until Lap 266, when he lost control in Turn 4, then wrecked even harder on Lap 279 after contact from Paul Menard. Rounding out the group was Michael Annett, whose throwback #46 Pilot / Flying J Chevrolet spun on Lap 110, then was torn open on the driver’s side in a Lap 126 crash with J.J. Yeley and Mike Bliss. The extensive damage to Annett’s car required more than 60 laps of repairs, though he did gather a few spots and finished under power. The race was won by Carl Edwards in the #19 Arris Toyota, meaning that the 43-car field was bookended by non-“throwback” cars. 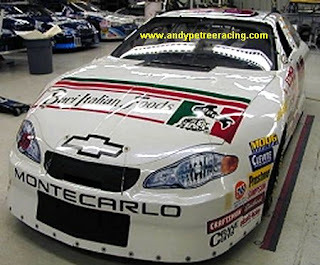 *This is the first last-place finish for the #35 in a Cup Series race since November 20, 2000, when Geoffrey Bodine’s Bari Italian Foods Chevrolet - a third entry fielded by veteran crew chief and team owner Andy Petree - lost an engine after 11 laps of the NAPA 500 at Atlanta. It was Bodine’s 14th start after returning from his terrible Truck Series crash that February. 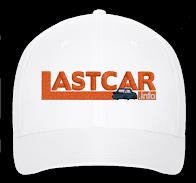 *The #35 had not finished last in a Cup race at Darlington since September 5, 1960, when E.J. Trivette’s 1959 Plymouth owned by M.J. Black fell out with handling issues after he completed just 1 lap of the Southern 500. It was the second of ten last-place runs for Trivette, who competed in 178 Cup Series races from 1959 through 1971. 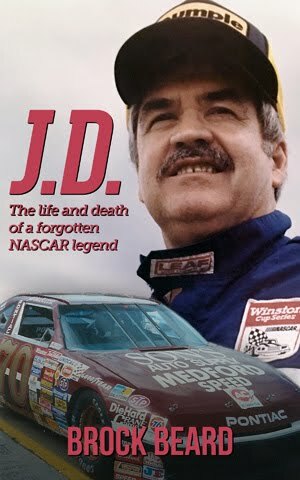 His best career finish came on a half-mile dirt track in Valdosta, Georgia, where he ran 6th on June 27, 1965. Ryan Ellis picked up the 4th last-place finish of his NASCAR XFINITY Series career in Saturday’s VFW Sport Clips Help a Hero 200 at the Darlington Raceway when his #17 Navy Seals vs. Zombies Ford fell out with suspension issues after he completed 1 of the race’s 147 laps. The finish occurred in Ellis’ 24th series start. The finish was Ellis’ first of the year and his first in an XFINITY race since last fall at Texas, 26 races ago. The finish also ended Jeff Green’s record-setting last-place streak at eight races. Green, who came home 38th on Saturday, can still break his single-season record of 15 last-place runs with a finish in any of the nine remaining races in 2015. For the second year, Ellis, a 25-year-old racer from Ashburn, Virginia, has split his time running partial schedules in both the NASCAR XFINITY Series and Camping World Truck Series. This year, he’s improved his career-best finish in both divisions. He came home 16th in the Truck opener at Daytona, giving longtime team owner Jim Rosenblum his best finish in the series since 2003, and was 22nd in the XFINITY Series race at Watkins Glen despite driving a car that wasn’t set up to run the road course. The car Ellis raced at the Glen was owned by Rick Ware, who again tabbed Ellis to drive at Darlington. 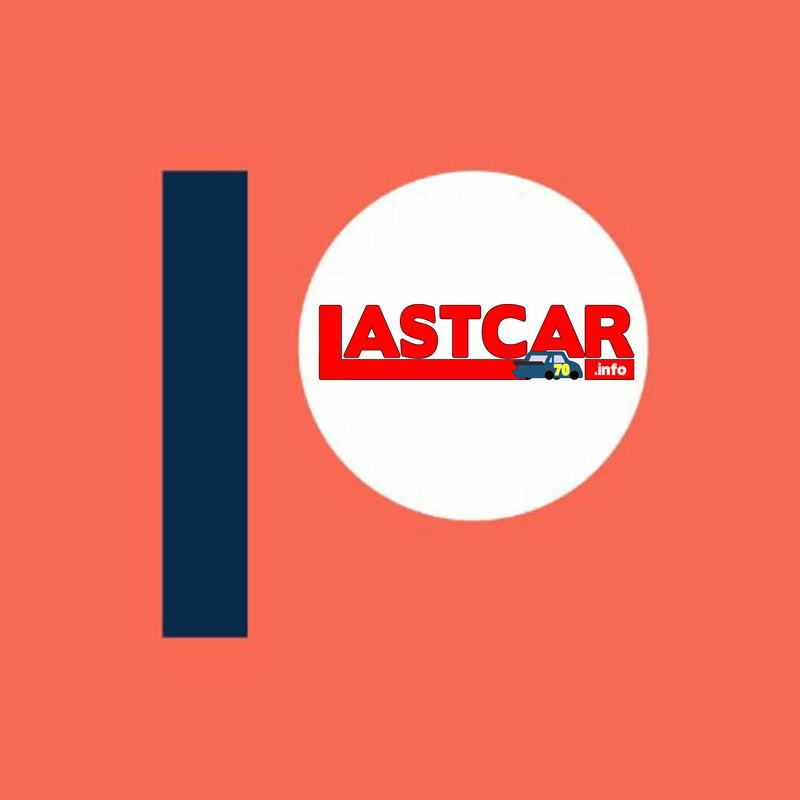 This time, the car Ellis would drive was a relatively new ride - the #17 Ford that Stanton Barrett debuted last week at Road America. Barrett, a part-time stuntman who has made infrequent NASCAR starts, arranged for the entry with the help of Ware’s team. It proved to be an up-and-down weekend: Barrett was unable to turn a lap in practice, but had muscled the car toward a respectable finish before a last-lap crash left him 26th. The crew apparently made repairs to Barrett’s car in time for Darlington, where Ellis was tabbed to drive. With Barrett’s directorial debut in the upcoming horror film “Navy Seals vs. Zombies,” now in post-production, the film’s title appeared on the hood of Ellis’ car. As at Road America, the #17 did not participate in either of the weekend’s practices, and a qualifying lap of 144.499 mph - more than five seconds off the pole speed set by Denny Hamlin - was the slowest overall. However, with 40 cars again entered to fill a 40-car field, Ellis secured the final starting spot. After one lap, he pulled behind the wall with suspension woes, followed three circuits later by Carl Long in Motorsports Business Management’s unsponsored #40 Dodge. Jeff Green did not exit until Lap 7. Rounding out the Bottom Five were Carlos Contreras, Ellis’ teammate, who fell out with crash damage on the #15 BYBExtreme.com Chevrolet, and T.J. Bell, making his first XFINITY Series start since Chicago in June driving the unsponsored #26 JGL Racing Toyota. Another longtime team owner, Johnny Davis, enjoyed one of his team’s best overall performances with two of his three cars finishing inside the Top 10. 8th went to Landon Cassill, his best finish since Road America last year, driving a #01 Flex Seal Chevrolet which paid homage to the late Butch Lindley, who won five of his six XFINITY Series races with the number. 10th went to Ross Chastain - his third top-ten finish in the last ten races - his #4 South Carlina Education Lottery Chevrolet honoring Joe Thurman, the first driver to race for Davis back in 1983. Thurman, the 1985 XFINITY Series Champion, never won a race in 184 series starts, but earned six top-five finishes, including a career-best 4th on four occasions. 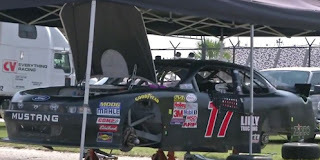 *This is the first last-place finish for the #17 in an XFINITY Series race since May 24, 2014, when Tanner Berryhill’s NationalCashLenders.com Dodge lost an engine after he completed 81 of the race’s 200 laps. The year before, Berryhill also scored the number’s most recent last-place run at Darlington with an early rear gear failure. *This is the first last-place finish by a Rick Ware-owned car since June 14, 2014, when Tim Schendel’s unsponsored #87 Chevrolet lost an engine without completing a lap of the Ollie’s Bargain Outlet 250 at Michigan.